Zuber & Company LLP specializes exclusively in civil litigation, primarily in the areas of property and casualty insurance law and personal injury litigation. From the firm's inception in February 1999 with just a handful of staff, we have grown to over 30 people while retaining an informal, boutique-style atmosphere. 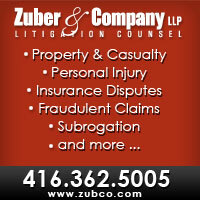 Please contact Zuber and Company LLP at 416-362-5005 to learn more about areas of services offered!